Shimmy is a self-excited oscillatory motion of a wheel around (an almost) vertical steering axis. This phenomenon can be violent and consequently dangerous. The progressive growth of vibrations amplifies in severe way the stress on the structures involved, and can lead to potentially catastrophic breakage or failure. This phenomenon can affect cars, motorcycles, aircrafts landing gears and also bikes in a certain range of velocities. In the case of the aircraft the oscillation can occur both on landing and take-off, which are the more critical moments in a flight. Shimmy usually involves torsional and lateral oscillation of the landing gear and can be coupled to and caused by flutter of the airframe. In 1989 main landing gear of Fokker 100 aircraft failed in the landing at Geneva airport without reasonable motivation. In fact, the landing impact could be considered as a soft landing. Because of the absence of any evidence of the presence of “pre-damage” showed by metallurgical investigation, grown the idea of the landing gear instability during or just after landing impact. This possibility is supported by the fact that the crew felt severe vibration preceding the main gear crash. The aim of this study is to create a model with multibody software ADAMS of the landing gear in order to observe what happen with particular attention at the shimmy phenomenon. 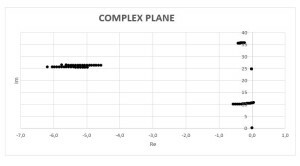 Another step forward is the result comparison with the theoretical study of Van der Valk and Pacejka, reported in the reference publication “An analysis of a civil aircraft main gear shimmy failure”. This work is divided into two parts: one oriented at reaching a satisfying modelling of the system and a clear highlighting of the phenomenon and the other with the objective of approaching the solution of the theoretical study with the introduction of the correct physical parameter. One of the major difficulties of the use of Magic Formula is the obtaining of the various parameter in order to implement the model. The lack of complete information in these field represent one of the limit of this work. The box represents the mass of the aircraft, that may vibrate in vertical direction thanks to joint 5. The tires used for the first part of the work are the motorcycle model 195/65 R15 default in ADAMS. For this reason, the starting mass of the aircraft was set to 100 kg. On joints 3 and 4 two torsional spring gives the necessary stiffness to the system. The objective of this section is to test the model. In order to trigger shimmy vibrations, the initial yaw angle was set to five degrees. 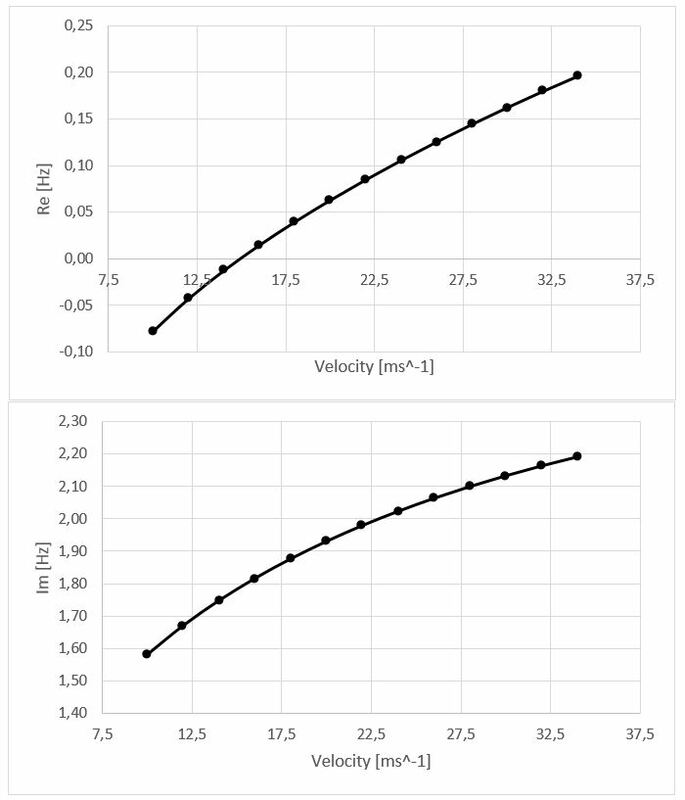 The landing gear was tested at different velocities and it is possible to see different behavior of the model: at low velocities (Fig.2) the initial yaw angle offset (5deg) decreases gradually and the system shows a stable response. On the contrary, at high velocities (Fig.3) the magnitude of the initial yaw angle offset grows progressively. The plot reports the yaw angle at two different speed: 15 m/s e 34 m/s. It is clear that the system passes from stability to instability with the growth of the velocity. Fig. 2 – Yaw angle response at low velocity (10 m/s). Fig.4 shows in the Argand diagram the eigenvalues of the system for speeds between 10 and 70 m/s. It is interesting to see that there is an eigenvalues with real part that becomes positive with the growth of the speed. Fig. 4 – Eigenvalues of the model, represented in the complex plane, at various velocities. Fig. 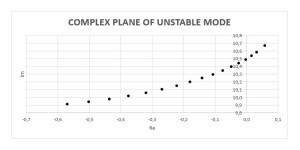 5 – Detail of the unstable mode in the complex plane. 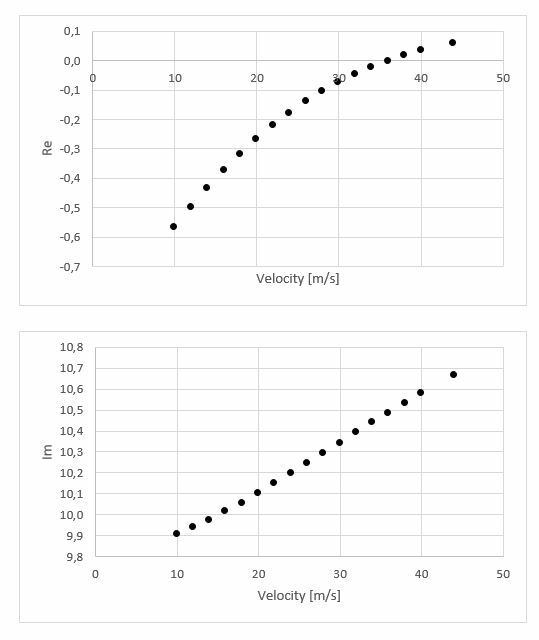 Every point is referred to a different velocity. It is possible to plot the Real and the Imaginary part of the Eigenvalues of the unstable mode in function of the velocity. The Real part increase with the growth of the speed. At a certain point the Real part becomes positive, at the speed where the landing gear get unstable. 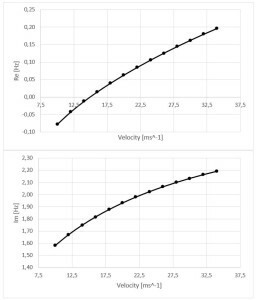 With a linear interpolation, the critical velocity is estimated to be 14.94 m/s. Fig. 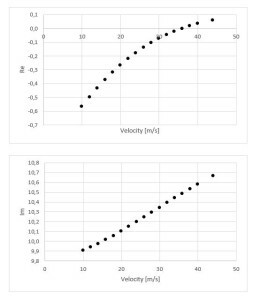 6 – Real and Imaginary part of eigenvalues of the unstable mode in function of the velocity. The second model has the ambition to achieve results consistent with the theoretical analysis presented in . The tab.1 reports the data of the reference paper used in the current model. Tab. 1 – Modelling data from ref. implemented in ADAMS model. 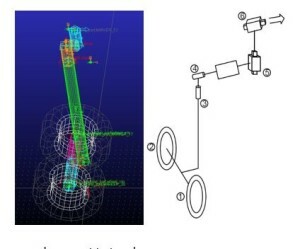 The physical parameter changed in order to model correctly the landing gear are reported in the tab below. The column with with “Previous” reports the data used in the section “preliminary simulation”, while the column with “New” reports the data used in the current section. 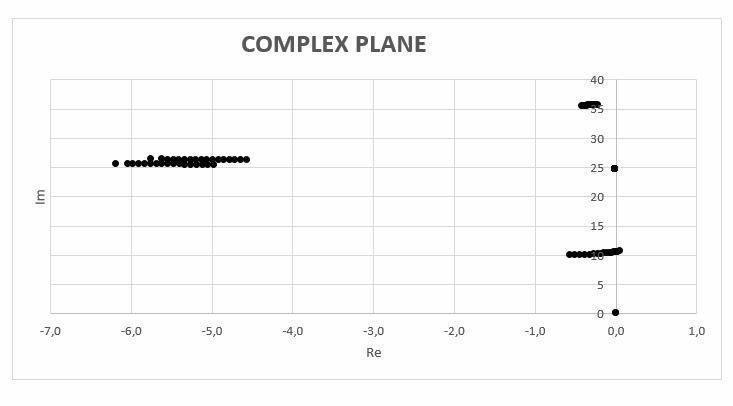 In this condition, an initial yaw angle of the landing gear causes a failure in the equilibrium analysis. In order to avoid the problem, the system is subjected to an impulsive force (500 N) 2 seconds after the start of the simulation (fig.7). This is necessary to trigger shimmy instability. Fig.7 – Impulce force function. With this new set of parameters the system has a stable behavior at every velocity considered, even above 100 m/s. Fig. 8 and fig. 9 report respectively yaw and roll angle in function of time. The system clearly damps the vibration in a very short time. Fig. 8 – Yaw angle of the model implemented with Fokker 100 parameters. Fig. 9 – Roll angle of the model implemented with Fokker 100 parameters. At this point, the model parameters were changed, in particular the stiffness of the yaw and roll torque spring. If these values decrease, shimmy phenomenon reappears. New analysis is conducted for the stiffness reported in tab.3. Tab. 3 – Stiffness changed values. For this configuration, it is possible to analyze the eigenvalues again (fig. 10). Even in this case there is a mode that gives instability of the system, when the real part becomes positive. Fig. 10 – Eigenvalues of the real model with different stiffness, represented in the complex plane, at various velocities. In the same way as before, one eigenvalue grows with the velocity, and when it becomes positive the landing gear starts to be unstable. In this case the critical velocity is around 36 m/s. Fig. 12 – Real and Imaginary part of eigenvalues of the unstable mode in function of the velocity. For velocity under the critical one, the vibrations triggered by the impulsive force, are damped by the system that returns to the stability. Fig. 13 shows yaw angle trend for a velocity of 10 m/s (VIDEO: no-shimmy-10ms). The same system, over 36 m/s becomes unstable (shimmy-40-ms): fig. 14 shows the trend of the yaw angle; A substantial difference with the preliminary simulation is the frequency of vibration, around 10.5 Hz, closer to the 27 Hz reported in . Fig. 14 – Yaw angle trend at high velocity (40 m/s) and FFT of yaw angle for frequency analysis. The multibody model of the Fokker 100 landing gear has been created in ADAMS and simulated both in the time domain and the frequency domain. Shimmy vibrations around 10Hz appears when reducing the baseline roll and yaw structural stiffness of the main fitting. Results have been compared with those reported in the literature, where typical frequency of 20-40Hz are observed. The differences are probably due to severe simplification in the geometry used in the model and incomplete tyre dataset.